News Americas, FORT LAUDERDALE, Fl, Weds. 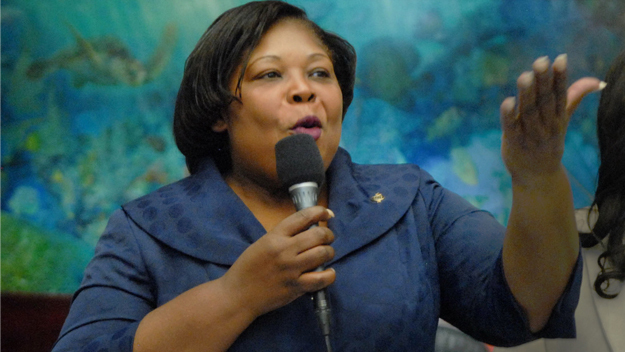 Aug. 29, 2018: Haitian-born, Florida State Senator, Daphne Campbell, lost her seat in Florida elections held Tuesday. Campbell, who was elected to represent Florida’s District 38 eight years ago in the state legislature, lost to wealthy former prosecutor Jason Pizzo, who captured 54.2 percent of the vote in Senate District. Campbell racked up a string of investigations and ethics complaints, including the time she filed a bill to ban red light cameras shortly after the family minivan was hit with five red light tickets during her tenure. The diverse northeast Miami-Dade district includes the largest Haitian population in the country. Pizzo held his watch party at the Midway bar in Little Haiti, and told the enthusiastic group to “look left, look right,” at the diversity of the crowd of supporters. Campbell, 61, was born in Cap-Haïtien, a city in northern Haiti, where she attended the SOD Nursing School, receiving her bachelor’s degree in 1981. Previous articlePuerto Rico – Donald Trump’s Katrina?